PURPOSE: The metal garden potted standing plant trellis extender metal tall provides supports for small flower pots and many kinds of climbing plants such as Ivy, roses, clematis, jasmine, cucumbers, blackberry, vining flowers, beans, peas,grapes, morning glories, long stemmed and potted vegetables; The iron wire grid garden trellis metal tall can be used to form a screen with more of it; The decorative garden trellis potted planter finial panels add height and variety to your lovely garden. 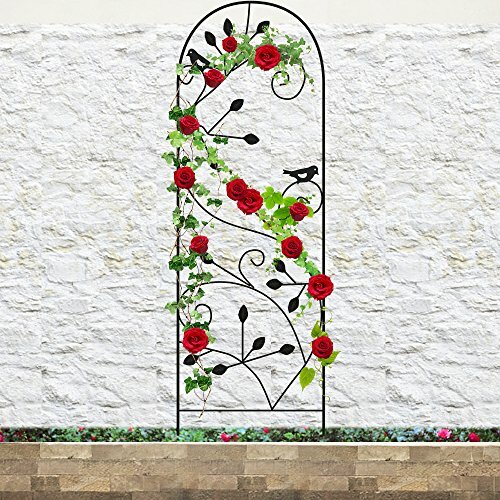 RUSTPROOF MATERIAL: The scroll trellis arch lattice outdoor decorative trellis is made of iron with rust proof black powder coated finish, which makes it could be used for both outdoor and indoor decoration to be clematis trellis,climbing plant trellis,climbing rose trellis,cucumber garden trellis,flower trellis,grapes trellis,iron trellis for climbing plants,metal garden trellis,plant trellis for pots,planters with trellis,planting pot with trellis,potted plant trellis,rose arbor trellis. STURDY & DECOR: The plant arch black trellis is welded with thick wires and is an architectural structure that is durable and sturdy; The vertical flat section with aesthetic design adds a stylish and nature touch to your yard with the garden trellis extender,plant trellis outdoor,trellis for climbing plants,trellis for climbing roses,vine trellis small potted,black trellis for climbing plants. EASY TO USE: An easy-install arched decor garden climber trellis, potted plant trellis,tall garden trellis metal,trellis netting,no need to assemble. Just stick trellis into the Ground or secure the trellis onto a wall, fence or near a pot. Note: Roses are for demonstration purpose only, not included. DIMENSION: 46" high x 15" wide, perfect size to work as wall rustproof black iron garden trellis for climbing plants clematis rose cucumber,rustproof black iron arbor garden trellis, proper size for in the large planting pot, garden trellis small flower pots with trellis working well with your planters in patio edges and raised garden bed corners to be metal trellis,outdoor decorative trellis,trellis for potted climbing plants,tall trellis for climbing plants,trellis for clematis.